Is it possible to remove the green stain caused by earrings? I have a blonde bubble cut Barbie with pearl earrings. Both ears are really discolored. Thank you for your help. I just recently got my Barbies from my mother's basement and am having fun identifying the dolls, clothes and accessories. It is sometimes possible to remove green ear. I have had great success with a product called Remove-Zit from Twin Pines of Maine. Some people use Benzoyl Peroxide (found in acne treatment creams). This is a bleach & it can also bleach the skin - so you are left with white instead of green and sometimes it also bleaches out the facial paint. There are also professional Restorationist who will remove green ear. The first thing you should do is remove the earrings, of course. Then remove the head and thoroughly clean the earring hole. I recommend passing a threaded needle through the hole to make sure you remove anything that is causing the green. I have had success with CLR (calcium/lime/rust)on my 1961 bubblecut barbie- hers was spread almost to the hairline, and within a few weeks of applying it every day (inside & out) she is almost completely green-free! And it has not caused any damage either. I also had success on her body with acne med (10% benzoyl peroxide cream) on her legs for dark stains from either clothes or her stand- in ONE day the stains were totally gone! I applied and put outside (warmer) and let dry, then wash off next day. 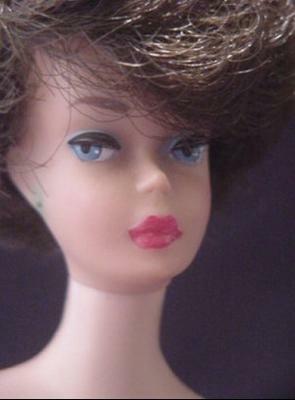 Mod barbie heads have not been so lucky- they have been through CLR and acne treatments and have barely faded at all. Don't bother. I am going to try some "mad-scientist" experiments to see if anything will work- I don't recommend mixing chemicals- don't try this at home! I will write again if I have any luck to share my results, otherwise you should assume nothing has worked for those poor mod girls. I could always market them as "Martian" Barbies if all else fails! Thanks for reading! Return to Barbie and Fashion Doll Identification. I believe that I have a ponytail #5 Barbie. The earrings were left in and left green markings around the ears as the metal corroded. Would there be any way to get rid of the markings that are left? The color has gone right into the doll. Treating a Vintage Barbie Doll for "green ear" can be a long slow process and if it is severe, it may never all clear up. Here is an excellent article on eBay about one method to remove the green without destroying the doll in the process. There is also a product made especially for dolls called Remove-Zit - I have used it in the past with great success - here is a review on eBay - Remove-Zit . Here is the link to the company's website - Remove-Zit. Have others used this method? Have you found something that works better? Potential for green ear in repro vintage sets? In regard to the vintage reproduction barbie sets do the earrings that come with these sets cause green ear if left in? Given the green ear is an old problem I was wondering if Mattel had found and hopefully used a different material to make the earrings these days that doesn't react with the doll in these newer models? Green ear for Vintage Barbie Reproductions is not a problem. Green ears on Vintage Barbie Dolls is caused by the vinyl reacting with the metal on the earring posts - neither of these (the same vinyl or the same metal posts) are used on the Vintage Reproductions. Comments for Potential for green ear in repro vintage sets? Many thanks. So okay to keep the repro earrings on the repro doll, but not on my 1963 Fashion Queen as they can still react with her vintage vinyl? Problems with new earrings causing green ear. I have seen the new earrings start to cause a problem. I don't know why. My suggestion is to make sure they are really clean, then coat them with a clear sealer, like clear nail polish and let it dry completely. Don't wet them while on the doll. This may be the problem,when others clean a doll, and the metal reacts, when left wet for long periods. can I clean the green off the ears? I've also had success treating green ear with CLR on a vintage titan bubblecut doll. If the ear holes are big enough you can also run CLR soaked in plain dental floss through them (if not leave it in for a few hours or days). CLR won't work on mod dolls though. I've had no luck with any kind of treatment so far on a mod doll. I've replaced all my doll stud earrings (bar one repro whic has larger holes and a pair of earrings that so far won't come out easily) with 'safe' ones (ie nylon posts). CLR works great- daily for a week. I had good luck with CLR. Several times Everyday for a week I would apply (on Q-tip) small amount to area. Almost disappeared. Faint faint hint maybe left. I also removed head and applied CLR on inside. I think this is important to really get the green to stop. You can also run a needle through hole the first time you apply. this was so easy. One doll got this from (Safe metal earrings) My suggestion is NO METAL. 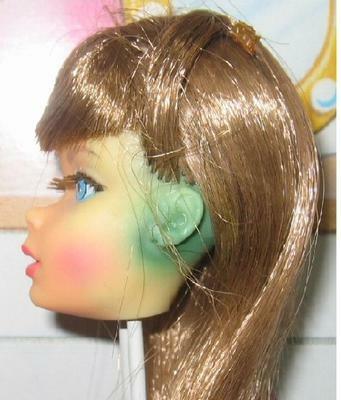 Yes, all modern dolls that have earrings with metal posts can get green ear, including repros. Green ear is caused by the base metal reacting with the plasticizer in the vinyl. Modern metal earrings are made of the same metal as vintage, and modern vinyl has plasticizer just like vintage vinyl. I know many, many people who have modern dolls with green ear, and many of them now remove the earrings of every modern doll they buy. The one positive is that it usually isn't as bad as that on vintage dolls, presumably because it hasn't had as much time to spread. My Barbie Learns to Cook repro has bright green ear as does my Artist Silkstone barbie. I have seen pictures of another silkstone with green ear and heard reports of numerous silkstone dolls having green ear. It's a shame that the doll is ruined because of the earrings which could have been left out or packaged separately,IMO. These dolls are not cheap! What about Vintage Barbie Dolls with Green Ears? I have a #3 Vintage Ponytail Barbie with the pearl stud earrings and the "green ears" that I've read about. Does this decrease the value, and is there a way to remove the staining? Yes, Green ears greatly decrease the value.